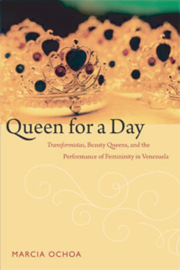 Queen for a Day is a queer diasporic ethnography of beauty and femininity that connects the logic of Venezuelan modernity with the production of a national femininity. This ethnography examines how femininities are produced, performed, and consumed in the mass-media spectacles of international beauty pageants, on the runways of the Miss Venezuela contest, on the well-traveled Caracas avenue where transgender women (transformistas) project themselves into the urban imaginary, and on the bodies of both transformistas and beauty pageant contestants (misses). Placing transformistas and misses in the same analytic frame enables Ochoa to delve deeply into complex questions of media and spectacle, gender and sexuality, race and class, and self-fashioning and identity. Venezuela has won more international beauty contests than any other. The femininity performed by Venezuelan women in high-profile, widely viewed pageants defines a kind of national femininity. Ochoa argues that as transformistas and misses work to achieve the bodies, clothing and makeup styles, and postures and gestures of this national femininity, they come to embody Venezuelan modernity. Marcia Ochoa is an Associate Professor of Feminist Studies at the University of California at Santa Cruz. An ethnographer of media, Ochoa’s work focuses on the role of the imaginary in the survival of queer and transgender people in Latin America, and the place of these subjects in the nation. She is a founder and advisor to El/La Para TransLatinas, a social justice project for transgender Latina immigrants in the Mission District of San Francisco, CA. Ochoa is incoming co-editor of GLQ: A Journal of Lesbian and Gay Studies.